woots i love the demo! i am so gonna try to build this one as soon as my parts order arrives (by next week i hope!). mark, is the switch 2-pos spst? and what is the role of the trimmer? is it just to increase the output gain? Yes 2 position SPST is all you need, but you'll probably find a SPDT switch cheaper so just get that and only use the middle and one of the other lugs. The trimmer biases Q2, so just rotate it until you get 9V on the drain of Q2. Does this circuit supposed to sound like the Brain Zeltzer by Nocturno? or is it a completely different pedal? No this is a take on the EP-Pre and EP Booster, you'll need to go one post ▼ for the Nocturne. Just one small correction: Fat 3 goes to ground (not Fat 1), otherwise everything works perfect! Oh Jimi, you've never lived if you haven't thought of that! :o) Jimmy Page swears by it! A question about my build. It seems the Fat control does not have much effect when the Body switch is engaged. Is that normal? Can this run at 18v? It IS run at 18V via the ICL7660S. You can't supply it with anything greater than 9V though, the maximum input voltage of the ICL7660S is 12V. I guess you wanna run it at 18V input just like you would for the DLS to get more headroom and beef. In that case...DON'T. You will fry the 7660S voltage doubler. 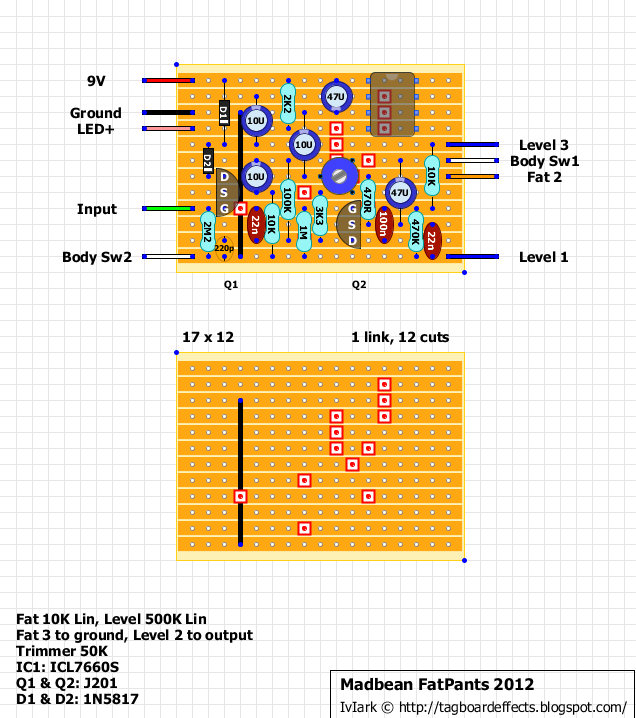 I suggest you take the 7660S from the Fatpants and put the voltage doubling circuit out of the main Fatpants board and use it to double the input 9V to 18V (it's 17.5V actually). Then run the 18V in parallel to both DLS and FP boards and house them together in a single enclosure. 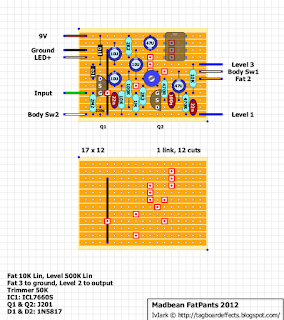 Do you have a good schematic for a 2-in-1 configuration? Ulysses did a nice schematic back in 2007 which is great. Is there a chance of updating this great layout to include the 2013 Fatpants update? I had a problem with a hum or whine when i built it, however I substituted the 7660 with a 1044 and it worked perfectly. Great little boost.